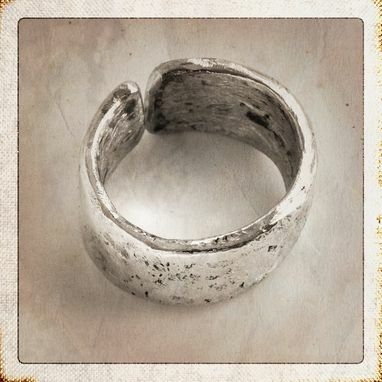 Argentium Silver thick split-ring, US size 11, handmade by me with a hammered, aged and oxidised texture. You buy the exact one shown here which is ready to ship. I can adjust this ring slightly smaller and at least a size larger if you wish. While it can be adjusted it will not easily change size on you and requires work to do so. If you're not familiar with Argentium do please research it. Essentially, it is a .935 sterling silver made with a germanium alloy. The result is a metal that stays brighter and tarnishes much slower (if at all) than ordinary sterling silver.